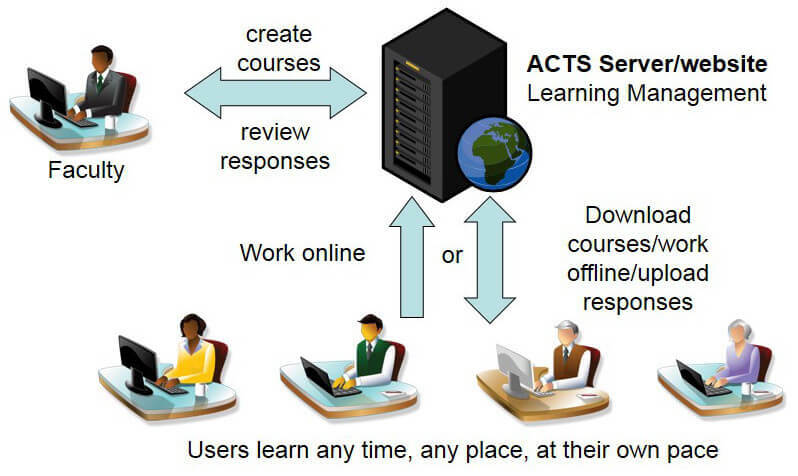 ACTS is a computer/web-based program that allows users to engage in simulated, realistic interactions and develop their communication skills using the strategies of Active Communication Training. ACTS has online and offline features. Completely online. Users work directly on their ACTS website. No special software is required. No files are saved on the local computer. Completely offline. Users must install the ACTS Player software on their local computer. Courses are installed directly on the computers. All user recordings are saved on the local computer. Trainers view user recordings on the local computer. Combined online/offline. Users download courses from the website, complete courses offline, upload selected recordings to the website for online viewing by trainers. Users use the website to view comments from trainers online.